Ethical Sourcing — Caprice Australia Pty. Ltd.
Caprice Australia is committed to ensuring socially and environmentally responsible sourcing practices across our entire supply chain in accordance with the law, international obligations, and our customer and licensor compliance requirements. We view ethical sourcing as a non-negotiable aspect of our business and, in turn, we expect the same from our suppliers. To meet our ethical sourcing commitment, Caprice has implemented an Ethical Sourcing Program that is applicable to all suppliers contracted by Caprice to supply merchandise to, or on behalf of, Caprice. · a Standard Operating Procedure documenting the Ethical Sourcing program’s governance structure, program objectives, internal roles and responsibilities and operational aspects of the audit program. 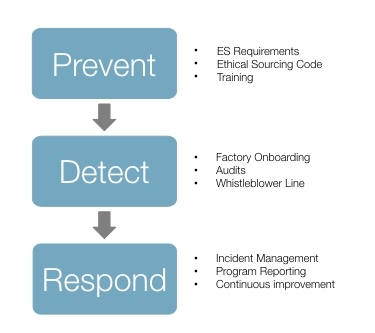 All Caprice supplier factories are required to register their factory in our online production management and compliance system 3clicks www.3clickscloud.com the ethical sourcing onboarding and audit processes will be managed via 3Clicks. suppliers will also have access to the caprice ethical sourcing manual containing all relevant information.